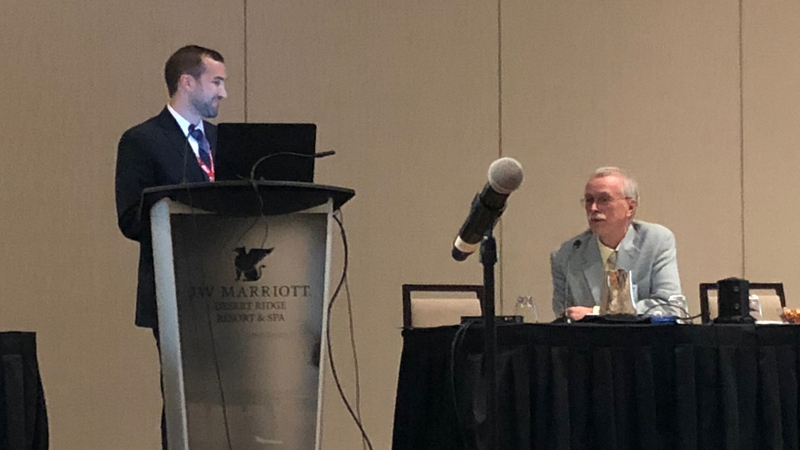 An abstract submitted by Matthew Perlstein, a resident in the class of 2020, was awarded Best of Meeting Oral Abstract Presentation at the Society of Cardiovascular Anesthesiologists (SCA) 40th Annual Meeting & Workshops held in Phoenix on April 28-May 2. Co-authors are Dr. Robert White, Gulce Askin, Dr. Robert Bowen and Dr. Lisa Rong. Dr. Perlstein presented the abstract, "Disparities of Socioeconomic Status and Abdominal Aortic Aneurysm (AAA) Repair Outcomes in the United States," at the conference. The research examined readmission rates following AAA repair for patients of lower socioeconomic status. Dr. Perlstein's research is part of a multi-project effort by the Center for Perioperative Outcomes (CPO) designed to investigate causes and methods for addressing healthcare disparities in surgical and anesthesia patients. The project is supervised by Dr. Zachary Turnbull, director of the CPO and medical director of performance improvement; Dr. Robert White, who is also a Van Poznak Research Scholar; and Anna Nachamie, operations administrator for the CPO. Dr. Kane Pryor, director of clinical research for the Department of Anesthesiology, also served as a faculty mentor. The SCA is an international organization of cardiac, thoracic and vascular anesthesiologists that promotes excellence in clinical care, education and research.